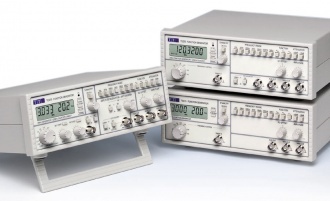 The TG300 series provides very high waveform quality under all conditions. That means low sinewave distortion, low aberration triangle waves and fast-edged square waves with low overshoot. Unlike many competitive products good waveform quality is maintained throughout the frequency range and at low output levels. The TG300 series provides bi-directional variable symmetry from 1:9 to 9:1. Unlike some products, frequency is independent of symmetry setting. The TG300 series provides a main output with a maximum emf of 20V pk-pk from a 50Ω or 600Ω source. An amplitude vernier with a range of 20dB is combined with two switched attenuators of -20dB and -40dB to provide levels down to 2mV pk-pk unterminated. Variable DC offset of ±10V is available via a centre detent control. An auxiliary output provides a fixed 0V to +5V level suitable for driving both TTL and CMOS loads.